Mistou shares the inspiration behind her designs, Coco and James. How would you describe your collection with BonLook? I wanted to design glasses that would work with every skin type. The styles needed to be universally-flattering in both shape and colour. I also wanted a style that didn't seem harsh, or that would only look good if all done up. 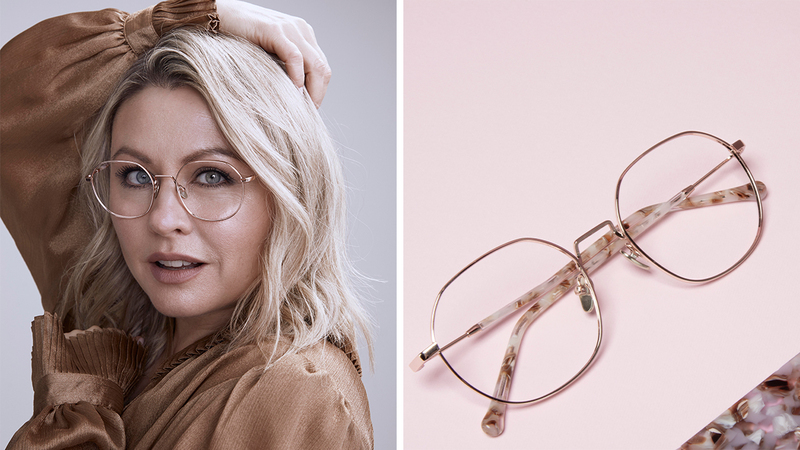 We're so used to wearing our glasses when we look put-together but we often forget about the everyday: when we're wearing our glasses first thing in the morning or right before bed time, those times of day when we don't have our faces on and our hair is just pulled back in a messy bun. I wanted to design glasses that would look great on anyone at any time of day. Why did you name your glasses Coco and James? I chose to name my glasses after my beloved Havana brown breed cats, Coco and James. The two of them are brother and sister, and they are absolutely inseparable. Coco and James have been a part of my family for more than four years. I just love how softhearted and full of character they are. I even like the way their names sound together. In fact, these are probably the two names I say aloud most often together (aside from the names of my two daughters, of course). I'd say my personal style is “rock chic”. I'm also really into wearing laidback, casual styles with an edgier side, too. Do you feel like your style has evolved over the last few years? It's definitely changed. If there’s one thing that’s really evolved, it’s that I now dare to wear bright, colourful clothing. Lately, it seems like I wear a lot of colour, more so than I ever have. For that, I have to give credit to the stylists I work with, who have helped me take my personal style to new heights. Through them, I've been able to let go of all the black that I used to be so comfortable wearing. Some days, I’ll even wear bold hues like banana yellow, which is something I wouldn't have considered before. It’s amazing what kind of reaction wearing colour can garner. I get so many compliments anytime I brighten up my look a little. If you had to wear only three pieces from wardrobe, what would they be? A good bra is a must! But all joking aside, if I had to choose, I'd have to say jeans. There’s nothing better than jeans that fit you just right. I love a pair of skinny, high-waisted jeans. You can wear them so many wears: casual, hippie-boho chic, and even edgy rocker. Anything goes with a good jean. Are you currently working on any special projects? What do you have planned for the coming months? For now, radio is still my top priority. I am the host of Mitsou et Jean Phillipe, which airs on [radio station] Rythme FM every weekday at noon. I also head mitsoumagazine.com and mitsouboutique.com, two digital platforms that are always evolving (thanks to my exceptionally hard-working team). Let’s just say that these projects keep me very busy. I’m also really passionate about writing, and everything content-related. Writing happens to be one of my greatest passions, and is, to this day, my preferred means of communication. It’s a really therapeutic exercise. I'm also still doing my regularTendences segment on the [television program airing on the TVA channel] Salut Bonjour! I'm also still working with Dazmo Group, the company I founded with my partner Iohann Martin et Andrew Lapierre. We’ve been at it for more than 20 years. I’m the spokesperson for the Breast Cancer Foundation. This has been such a fulfilling role for me, one that I’m proud to have been a part of for more than 13 years. Singapore for its striking architecture, Copenhagen for its breathtaking landscape, and Havana because of its culture, retro décor, and the warmth of the Cuban people. When I’m with my daughters, we listen to a lot of Drake and Tyler the Creator. When it comes to Quebec artists, I've always got Ariane Moffat, Pierre Lapointe, or Loud playing. Kate Moss because of her attitude, Grace Kelly because she was so classy and chic, and Drew Barrymore, because of her ease, sense of humour, and just her overall approachability. Isabel Marant, Anine Bing, and Rachel Comey. All these designers make pieces that just feel so me. Prefer a chat over bubbles, rosé, or a coffee? Why choose just one when you can start the day off with a coffee and finish with a glass of bubbly? I’m not much of a brunch person. I find that I’m always so hungry at first, and then so full after the meal. I’m much more of a supper kind-of-girl.